Discussion in 'Lasershow Designer BEYOND' started by masterpj, Oct 3, 2015. Hello Pangolin and it's users. I normally use my QM2000 but I own 2 FB3's as well *which I rarely use because I mostly use LD2000 minus live stuff. I'm switching over to use BEYOND more from now on with all the changes that has been made to it and I started to use my FB3. I just finished the advanced color balancing but my green dpss always likes to have a slight signal applied to it to improve it's modulation (it's a cheap dpss green). If I do not apply a little signal to the green just before it really lases I get a slight increasing and decreasing line when doing graphics with a low point density. While I could possibly adjust the threshold *if the driver would allow it on this one* This method is now what I want to use just like in LD2000. I can tick Apply color setting to blanked lines which fixes the issue.. but this setting gets untoggled as soon as a click ok on the color training. Is this a bug or is there just no way to do this yet? My assumption is to avoid a beam coming out of the unit if another system is hooked up so maybe a prompt is in order on unknowing users or possibly not having the feature on when nothing is being scanned *even though I prefer to have it on to keep my dpss units close to their lasing threshold. Hey PJ; I will have this reviewed and get back to you. Thanks Aaron! This would be a major help with any DPSS laser systems especially the ones with stability problems. However it would be wise for people who would enable such a feature to get a warning. It could set off a lasing threshold on different projectors.. even worse would be if the system was TTL. I would most certainly not exclude the feature though.. just make it harder to be randomly enabled. 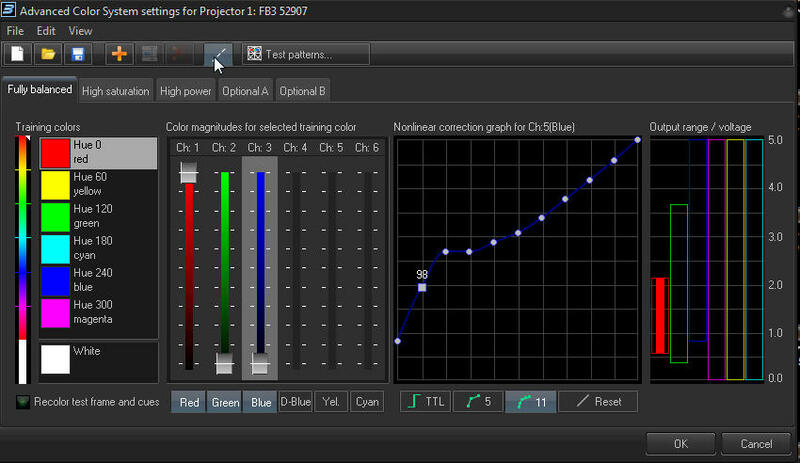 During color training, we allow you to see blanked lines by pressing the button you did. We do this so that you can get an accurate adjustment of the minimum level needed to cause light from the laser. When you click OK and exit the color dialog, we "enforce" a situation where -- if the laser should be blanked, we output zero volts no matter what. This was done for safety reasons, and I'd be a bit nervous about changing it. However, we are investigating adding an option that will do this all the time. To maintain safety, we will make it "enforce" that all output voltages are zero when the projector is supposed to be showing nothing at all, but allow the voltage to be elevated (as adjusted) when actual content is being displayed. Moreover we can have this option on a palette-by-palette basis (BEYOND supports five separate palettes) to give you some additional flexibility. Please contact us privately to obtain a BETA version of software so you can see how well the new options work. Didn't see this earlier. Will do Bill! What you just described will likely solve the issue!